Discover out-of-the-way places like Rauhaniemi Beach and Viikinsaari Island. Attractions like Sarkanniemi Theme Park and Hatanpaa Arboretum make great kid-friendly stops. There's much more to do: get your game on at Portaali VR, take in the architecture and atmosphere at Church of St. Alexander Nevsky and St. Nicholas, and take in the spiritual surroundings of Tampere Cathedral. To find traveler tips, photos, reviews, and more tourist information, read Tampere travel route planner. Zurich, Switzerland to Tampere is an approximately 7-hour combination of flight and train. You can also fly; or drive. The time zone changes from Central European Time (CET) to Eastern European Time (EET), which is usually a 1 hour difference. In July, Tampere is slightly colder than Zurich - with highs of 24°C and lows of 13°C. Finish up your sightseeing early on the 24th (Wed) so you can travel to Kuhmo. Kuhmo is a town and a municipality in Finland and is located at the south-eastern corner of the Kainuu region. Kick off your visit on the 25th (Thu): look for all kinds of wild species at Wild Taiga and then identify plant and animal life at Boreal Wildlife Centre. Find out how to plan Kuhmo trip without stress by asking Inspirock to help create an itinerary. Traveling by car from Tampere to Kuhmo takes 6.5 hours. Alternatively, you can fly. Cap off your sightseeing on the 25th (Thu) early enough to travel to Kuopio. Kuopio is a city and a municipality located in the region of Northern Savonia, Finland. Kick off your visit on the 26th (Fri): take in panoramic vistas at Puijo Tower, test your problem-solving skills at popular escape rooms, then immerse yourself in nature at Snellman Park, and finally explore the activities along Valkeisenlampi. Plan a Kuopio trip in moments using our itinerary builder. Traveling by car from Kuhmo to Kuopio takes 3 hours. Expect a daytime high around 24°C in July, and nighttime lows around 15°C. 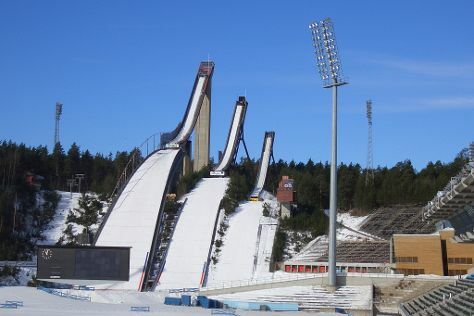 Wrap up your sightseeing on the 26th (Fri) early enough to travel to Lahti. Lahti is a city and municipality in Finland.Lahti is the capital of the Päijänne Tavastia region. Start off your visit on the 27th (Sat): take a leisurely stroll along Vesijärvi harbor, then admire the local landmark of Musical Fountain, and then have fun at Lahti Sports Center. To find where to stay, traveler tips, other places to visit, and more tourist information, refer to the Lahti trip itinerary builder tool . You can do a combination of flight and train from Kuopio to Lahti in 3.5 hours. Alternatively, you can drive; or take a train. July in Lahti sees daily highs of 24°C and lows of 15°C at night. Finish your sightseeing early on the 27th (Sat) to allow enough time to travel back home.